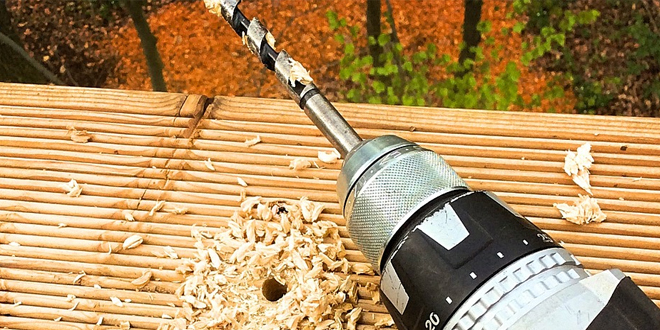 Installers know that a drill is one of the essential pieces of kit to get their jobs done well, but not all drills are the same. For tradespeople looking for relentless power and optimal torque, an electric drill is a logical choice for many people. This is not always the best choice, though. Such a drill has a limited application due to the length of its extension cord. A cordless power drill is a more mobile solution, which still provides enough power to perform a variety of drilling tasks. While some customers may regard this Makita power drill as a costly product, it has plenty to give for the price in comparison with other cordless drills. First of all, this tool offers a decent torque and power. Its 4-pole motor delivers 480 in-lbs of torque. The XFD10R comes with a 2-speed transmission that lets you adjust the drill speed according to the type of the job. With the lower setting, the speed is limited to 600 RPM. On the other hand, the upper setting is meant to heavy-duty jobs as it increases the speed limit to 1,900 RPM. The drill features the innovative extreme protection technology that protects the device from damage by dust, water, and other elements. There’s also built-in dual L.E.D. lights that enhance visibility when working in dark conditions. If you’re looking for a compact, lightweight, and versatile cordless drill, look no further than DEWALT DCD790D2. This powerful tool is designed in such a way to reduce operator fatigue for better control and balance while working. It is equipped with varied clutch settings. In fact, there are a total of 15 clutch settings to choose from. That allows you to fine-tune the speed and torque as you work. The drill is powered by a 20V Li-ion battery that lets it run at up to 2,000 RPM. With a fully charged battery, the drill is capable of running for roughly 43 minutes. The drill in question can double as a screwdriver if needed. Just make sure to use the lowest speed setting for this purpose. When you are working on a more demanding task or tougher material, switch to the upper-speed setting for the best results. That makes the DCD790D2 suitable for both lightweight and heavy-duty repair tasks. Providing unparalleled durability with impressive performance, the Bosch DDS182-02 is one of the best cordless drills these days. It’s fitted with a 18V Li-ion battery that enables the drill to charge fast while offering 54 minutes of a runtime. In addition to the high-capacity battery, such a comparative runtime is also attributed to the powerful brushless motor and variable clutch settings. The drill can produce approximately 442 inch-pounds of torque while reaching the speed between 0 and 1,700 RPM. Designed as a do-it-all commercial product, the Milwaukee 2703-22 is, without a doubt, one of the best deals you can find today. This battery-powered cordless drill features a lightweight and compact ergonomic design. There are two batteries included to maximize the running life and cut back on downtimes. The powerful brushless motor makes the drill capable of handling just about any drilling task. It produces 725 inch-pounds of torque. The Milwaukee 2703-22 also boasts the REDLINK PLUS technology by which improves the efficiency of the product. In fact, this innovative technology enhances the energy transfer between the battery, charger, and the unit itself. It results in a more efficient operation of the drill. Last but not least cordless drill you should consider buying is the RK2852K2 by Rockwell. What’s more, it is the best drill on our list in terms of performance. The unit combines convenience and efficiency with long battery life to achieve the optimal operation. Single sleeve, metal 1/2″ ratcheting chuck can hold bit firmly even through the toughest applications. Brushless motor is mated to multiple speed transmission, producing a maximum of 531 in-lbs of torque while operating at a speed between 0 and 2,000 RPM. You will also love the firm grip offered by this drill, which reduces slippage and thus prevents accidents during the work. It comes with a built-in LED work light that comes in handy when you work extra hours in dark areas. Now that you are familiar with the best cordless drills on the market, it should be an easy task for you to pick the right one. Be sure to choose the drill that best suits your job and you won’t go wrong. I have used DEWALT DCD790D2 model. It has excellent quality, and I totally satisfied its performance. Its battery backup is also good. Thanks for sharing this great article. Have a nice day.